In a recent post, I talked about the professional opportunities for DAN Instructors and how that can bolster your diving resume and enhance your professional diving career. Let’s take a look at what goes on in the DAN Instructor Qualification Course (IQC). The DAN IQC has a modular format. There is a core module that all instructors need to complete, either online ( no additional cost) or in-person with a DAN Instructor Trainer. At the start of the DAN Instructor Qualification Course, your trainer will present the mini-core presentation. The Core and Mini-Core modules discuss the various DAN diving first aid courses, Standards and Procedures for conducting DAN courses, Good Samaritan laws, disease transmission, equipment safety and how to conduct and market DAN courses to your divers. 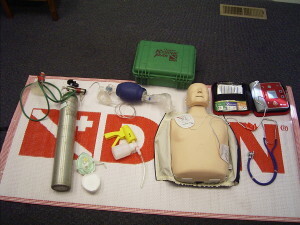 Basic Life Support-Health Care Professional with First Aid: training at the healthcare-provider level, including 2-person CPR and providing care to children and infants. If you’re not already currently certified as a provider in the course you’re training for in the DAN IQC, your instructor will integrate knowledge development and skill development at the provider level during the DAN IQC module. Your teaching presentation is evaluated on a simple scale. Areas evaluated include introducing the skill, demonstrating the skill, having students practice the skill, problem solving and debriefing. The written exam covers material presented in the provider course. There is a core section that includes general standards and procedures and an appendix including commonly used forms. For each DAN IQC course module, there is an instructor guide, reference copy of the provider manual, slate(s) and a USB thumbdrive that includes presentations and a copy of the instructor guide. As materials are updated, you’ll be able to download revised copies of the instructor guides from the DAN website. Who can attend a Divers Alert Network Instructor Qualification course and become a DAN instructor? You need to be a dive leader (instructor, assistant instructor, divemaster, divecon, etc) with a recognized scuba training agency. You need to be a current CPR & First Aid instructor, unless you’re completing the Basic Life Support and First Aid IQC module. To maintain your DAN teaching status, you need to maintain your DAN membership and teach the programs you’re authorized to teach. More details on this will be provided in the IQC Core and Mini-Core modules, suffice it to say you need to teach to stay current, otherwise you might need to attend another DAN Instructor Qualification Course to regain your teaching status. DAN Instructors are on the front lines of diver safety. Take an active part in making scuba a safer sport and having more trained responders: Become a DAN Instructor!